In most cases, home renovations can get out of hand. However, the truth is that they don't have to. Also, frugality in home renovating doesn't mean that you have to sacrifice attention to detail or aesthetic quality - quite the opposite, in fact. When it comes to your bathroom, this is especially true, because there most likely isn't a lot of space to begin with, so you are almost forced to find ways to keep the costs down. Moreover, you may want to think of some bathroom design ideas that are relatively easy to complete - you don't want to be working on your bathroom for multiple months. Here are some easy and affordable renovation design ideas. 1. Wallpaper. This is by far one of the easiest and most affordable ways to give your bathroom a new look and feel. The best part about wallpaper is that you buy what you need - according to the measurements of the walls - and then you place on the wallpaper; there are no second coats. You can go for something floral or you can go for something dark - you could also go for a tromp I'oeil look that will really make your bathroom come to life. 2. Radiant heated floors. Ready for a surprisingly luxurious bathroom renovation idea that won't be too expensive? Radiant heated floors can be really easy to install if you have a small bathroom, and they are affordable if you install them yourself. Imagine getting out of the bath or shower and feeling the warm ground instead of cold tile or linoleum. These radiant heated floors also have the benefit of heating up the entire bathroom and reducing the amount of moisture in the air, which will reduce the amount of mold that is common with some bathrooms. 3. Switch out the sink and faucet appliances. When it comes down to it, it is often the small details that really make a bathroom come to life. This is why you may want to head over to Exotic Home Expo to check out all the faucet appliances and hardware you can install in your bathroom. You could go for a matte black look or you could go for a luxurious-looking stainless steel - both will add a whole new layer of sophistication. 4. Change the way you shower. 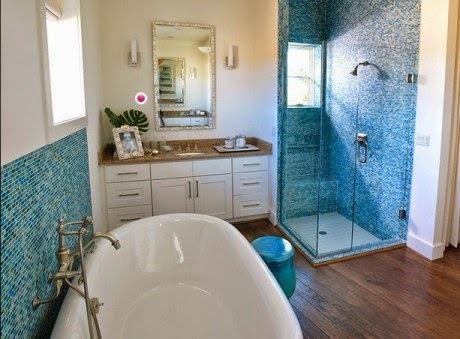 Another way to renovate your bathroom is to add a showerhead. Instead of your old leaky heads, why not install a soothing showerhead with multiple pressure settings. You could even purchase a showerhead with a Vitamin C infuser, which is supposed to help reduce the amount of chlorine in the water. Just adding this small detail will make your bathroom your new favorite room in the house. 5. Add a fun mirror. Every bathroom needs a detail that makes people think. Well, your bathroom mirror is the perfect item to make a statement with. You can easily find an old funky mirror and restore it - or you can look online for a vintage mirror. In the end, gold tones make a big statement, but so do loud colors, like yellow and green.